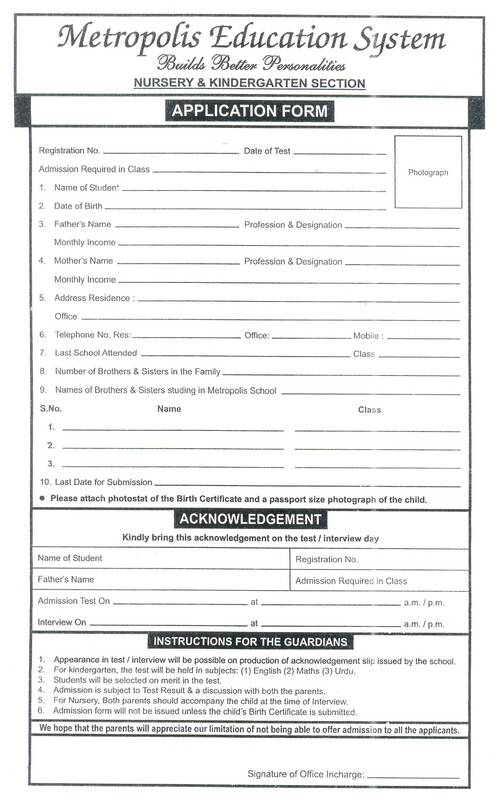 A registration form is issued to a child for taking admission in schools or colleges. 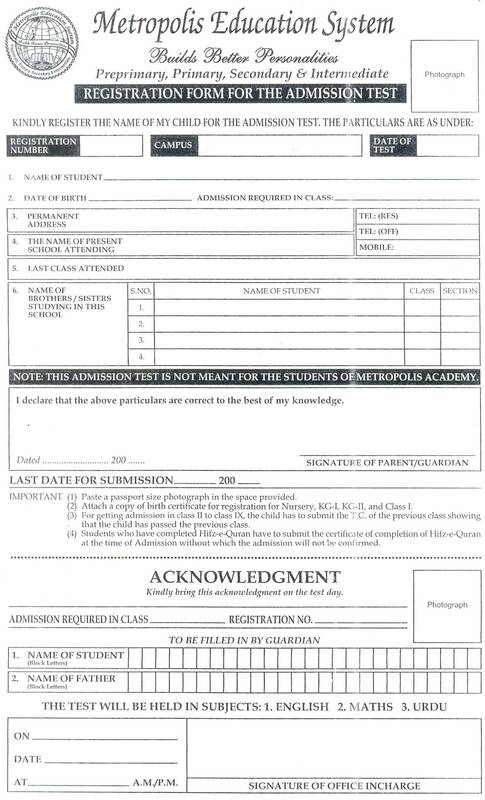 The purpose of issuing this registration form is to add the name of the student who intends to appear in an admission test or interview for getting admission in school or college and it does not guarantee an admission in itself. A nominal fee is charged for issuing a registration form to cover the clerical, test and administrative charges. 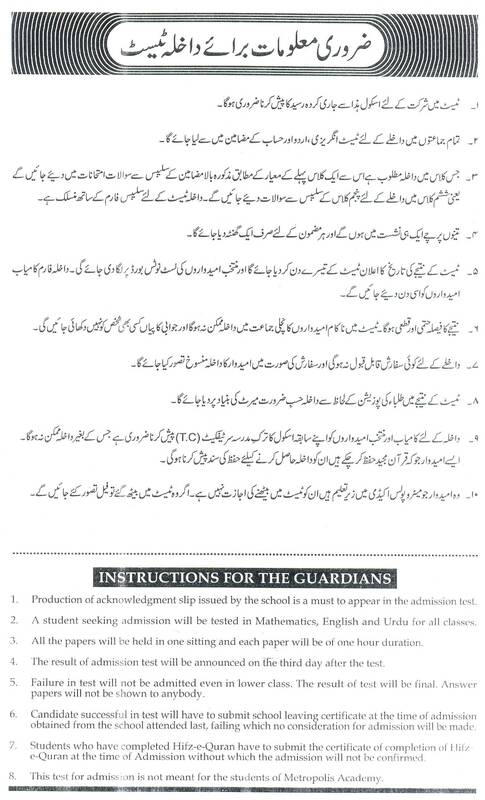 A prospectus is issued with the registration form to fully familiarize the parents with all the policies of the Metropolis Education System. 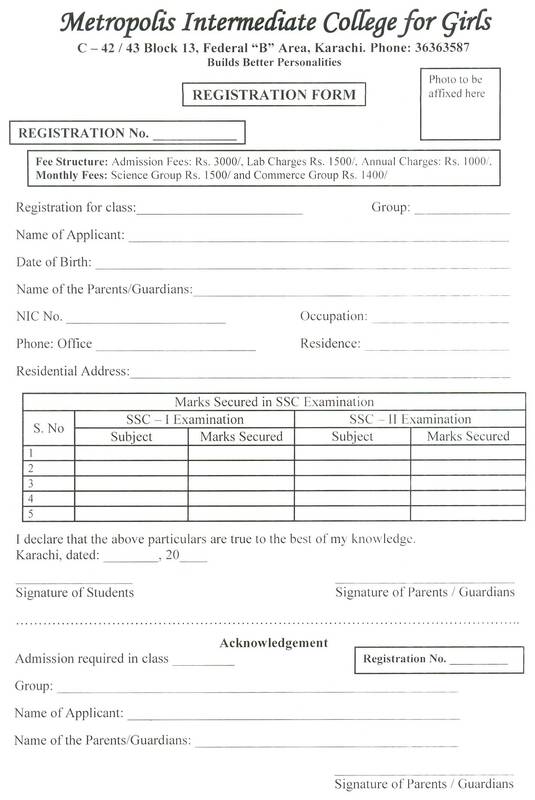 On submitting registration form, the child is given a date for the admission test which may vary from school to school and from college to college. Registration is made open only if seats are lying vacant in any class. The schools and colleges has all the rights to refuse the registration, if no seats are lying vacant in any specific class. Admissions tests and interviews for admission in schools are normally conducted in January / February. For the colleges, the admission tests are conducted in June / July. A syllabus specification for the subjects in which the child is evaluated is provided to parents with the registration form. The result of the test is announced within a week. Further details regarding the interview, fee schedule and other requirements are provided when the result is announced. An informal individual assessment test is taken combined with an interview with both the parents. Generally, the reading level of a child, the vocabulary and concepts of colours and numbers are assessed. In addition, the confidence of the child, the level of spoken English and motor skills are taken into consideration. Application for Class I onward are tested in three subjects – English, Urdu and Mathematics. The pass percentage is 50%. Duration of each paper is approximately 30 minutes. The list displaying names of selected candidates will be put up on the notice board of the concerned branch on the date given by the school. In all cases, merit is the sole criterion for admission. The decision of the school cannot be challenged in any way and will be final. Fee is subject to review annually. No Admission will be taken after April 30th. Fees are charged for all twelve months of the year and are payable each month. The fees payable for the period of the summer vacation are paid in advance. The school regrets that concessions are not offered on general grounds and especially on account of the siblings that are enrolled in any campus. Fees paid after the due date is subject to a fine as mentioned on the fee card. If the tuition fee has not been paid by the end of the second month, the student is automatically withdrawn.